On September 7, a three-way summit in Tehran failed to produce a clear agreement between Russia, Turkey and Iran on the fate of Syria's Idlib province, the last stronghold of the Syrian armed opposition. A ceasefire suggested by Turkish President Recep Tayyip Erdogan was rejected and a fully-fledged government offensive now seems imminent, in what is expected to be Syria's deadliest battle yet. Idlib is the last barrier standing between the Syrian government and its military victory against a rebellion that began more than seven years ago. The northwestern province bordering Turkey was one of the four "de-escalation zones" agreed by Ankara, Moscow and Tehran in May 2017 during the fourth round of the Astana talks, launched earlier that year with the aim of pursuing a political solution to Syria's conflict. One by one, the other three areas - Homs; Eastern Ghouta; and Deraa and Quneitra - have been captured by the Syrian government forces and their allies. As Damascus clawed back opposition-held territory, thousands of civilians and rebel fighters from those areas were bussed to Idlib, dubbed a "dumping ground" for evacuees. Amid persisting uncertainty, three scenarios are likely to emerge in Idlib: a massive onslaught; a protracted offensive; or infighting between rebels followed by a reconciliation deal with Damascus. But whatever actually occurs, it will be the civilians currently trapped in the densely populated province that will pay the highest price. What countries are involved and what are their aims? Five major players are likely to decide what happens next in Idlib: the Syrian government and its allies Iran and Russia, as well as Turkey and the United States. Syrian President Bashar al-Assad, who has repeatedly has vowed to take back "every inch" of Syria, pursuing a "military solution" to the conflict. His goal is to regain complete control in order not to have to make any concessions to the Syrian opposition. Taking over Idlib would mean that the opposition has no territorial presence and consequently no leverage in any future negotiation process. In the short-term, the government wants to establish control over two major highways - the M4, which connects the port city of Latakia to Aleppo, Raqqa and oil-rich Deir Az Zor; and M5, which links the capital Damascus to Aleppo, and eventually to the trade route to Turkey and Europe. Iran has no direct strategic interest in Idlib, especially since the completion of an evacuation process in the two Shia towns of Foua and Kefraya in July. However, Tehran is backing the offensive with its militias as it shares the same goal with Damascus of eliminating the armed opposition. Iran's military assistance goes hand-in-hand with its efforts to entrench its presence permanently in Syria despite pressure from the US, Israel and Russia to withdraw. Moscow, like Damascus and Tehran, also wants Idlib captured, but it would prefer to have the opposition surrender and integrate into the Syrian military divisions under its control (such as the Fifth division) rather than fight a costly battle. It hopes that the capture of the rebel bastion would force Turkey, the European Union and the US to negotiate a political solution along with its goals, as well as give it more leverage in talks on the suspension of US sanctions and a resolution in Ukraine. For its part, Turkey - Idlib's guarantor power under the Astana agreement - is keen to prevent an offensive on the region and maintain some level of control over it. Already hosting over three million Syrians, Turkey fears a major crisis in northwest Syria would further strain its overwhelmed humanitarian capabilities and prompt the influx of more refugees onto its territory. It also wants Hay'et Tahrir al-Sham (HTS, one of the two main armed group controlling Idlib) dissolved so that Russia has no justification to attack the province. Moscow has designated HTS a terrorist group. At the Tehran summit, the leaders of Turkey, Russia and Iran expressed different opinions about the way forward in Idlib, but in a joint statement reiterated that the Syrian crisis can reach a final resolution through a "negotiated political process". The US, meanwhile, has no strategic interest in Idlib and has indicated that it does not oppose a limited offensive on Idlib. It also wants the HTS eliminated and has already targeted a number of its leaders through drone attacks. However, Washington has threatened military action if the Syrian government uses chemical weapons. On September 3, US President Donald Trump warned in a post on Twitter that Assad "must not recklessly attack Idlib", adding that it would be "a grave humanitarian mistake" for Moscow and Tehran to "take part in this potential human tragedy". The US worries about Iran's presence in Syria and has demanded that Iranian forces and militias withdraw. The Trump administration, which earlier mulled a withdrawal of its troops from northeast Syria (territory under the control of US-allied Kurdish-led Syrian Democratic Forces), has now made provisions for their indefinite stay. Is Idlib a 'hotbed for terrorists'? Idlib province is controlled by two major armed groups: HTS and al-Jabha al-Wataniya lil-Tahrir (the National Liberation Front, NFL). Over the past few months, Russian officials have been calling for the elimination of HTS. "This is the last hotbed of terrorists who are trying to speculate on the region's status as a de-escalation zone, who are trying to hold the civilian population hostage as human shields," Russian Foreign Minister Sergey Lavrov said recently. HTS, formerly known as al-Nusra Front, has significant presence in Idlib city and other areas in the province. Al-Nusra Front emerged in 2012 as al-Qaeda's affiliate in Syria, but in July 2016 it renounced its pledge of allegiance and changed its name to Jabhat Fatah al-Sham. Last year, after it attacked other rebel groups in Idlib, it joined forces with a number of more hard-line factions and changed its name to HTS. According to some estimates, HTS has some 10,000 fighters in Idlib, a large part of whom are foreigners. But Ahmad Abazeid, a Turkey-based Syrian analyst, says that figure is an exaggeration, instead numbering a few thousand. In addition to HTS, there are also the smaller and more hardline al-Hizb al-Turkestani (the Islamic Party of Turkestan, made up mainly of Uighur fighters) and Heras al-Din (the Guardians of Religion, a splinter of HTS). The other large player in the province is NFL, a loose coalition of armed groups that are considered part of the moderate opposition. Largely seen as the main Turkey-backed actor in Idlib, NFL includes a wide variety of groups - from the more hardline Nour al-Din al-Zinki and nationalist Islamist Ahrar al-Sham (the Free Men of the Levant) to Jeish Idlib al-Hor (the Free Army of Idlib), an affiliate of the Free Syrian Army (FSA), another organisation created in 2011 by officers who had defected from the Syrian army. Some have suggested the NFL fighters number in the tens of thousands, but Abazeid also cast doubt on those estimates. "NFL is the biggest force [in Idlib] in terms of numbers and geographical presence and weaponry," he said. "But NFL is a local formation, not an organised army, and therefore it's difficult to estimate its numbers." According to Abazeid, Turkey has been pressuring for some time now HTS' leaders, as well as seeking to sow internal divisions, in a bid to dissolve the group and leave Russia and Assad with no excuse of attacking Idlib. "[Turkey] renewed its efforts in this direction as Russia's threats of an attack on Idlib intensified, but it failed. HTS, on its part, has said that it won't dissolve itself because the attack on Idlib will happen anyway," said Abazeid. On August 31, Turkey officially designated HTS a terrorist group, fuelling speculation that it could consider engaging in a campaign against it or encouraging NFL to attack it. What would be the human cost of the battle for Idlib? Idlib province hosts more than three million people on a relatively small area of about 1,437 square kilometres. Given the high density of the population, an aerial campaign and a ground offensive is expected to result in death at a huge scale. Erdogan has warned of a "bloodbath", while Staffan de Mistura, the Syria envoy for the United Nations, has said that Idlib will be the "perfect storm" if a large-scale assault is not avoided. "If they shoot a bullet, it would probably kill two people," said Syria researcher Marwan Kabalan, director of the Arab Center for Research and Policy Studies. An offensive is also likely to result in mass displacement. According to Fadel Abdulghani, founder of the Syrian Network for Human Rights (SNHR), about one million people would be uprooted in the event of major offensive. "They would amass by the Turkish border or head to Jarablus or Afrin," said Fadel, referring to the Turkish-controlled cities in northeastern Syria. It is unclear whether Turkey, which sealed off its border with Syria last year, allowing only humanitarian aid to go through, will agree to admit any more Syrians into the country. Idlib itself already hosts more than 1.5 million internally displaced people (IDPs), who fled the advance of the Syrian government in other provinces. Many of them reside in makeshift camps which lack basic services such as clean drinking water and access to uninterrupted electricity. 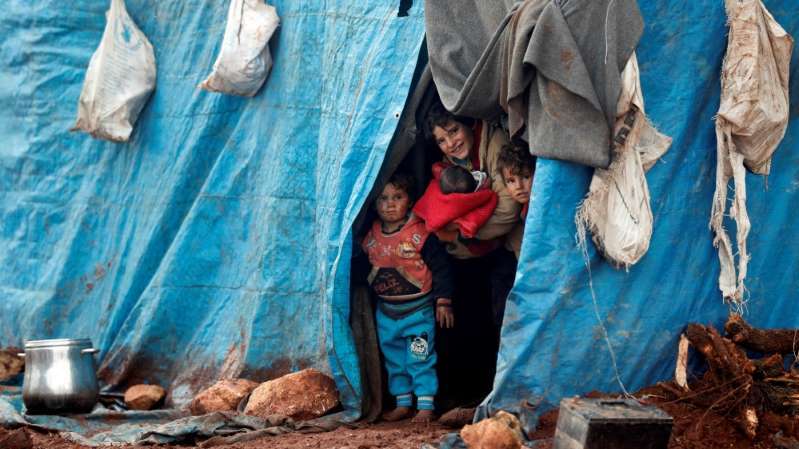 According to Ahmed Mohammed, a representative with Islamic Relief Worldwide who visited Idlib recently, many IDPs live in squalid conditions. "Idlib is the last shelter for these people (IDPs), many of whom have moved from one place to another up to four of five times," Mohammed said. His organisation has documented "indiscriminate attacks" targeting civilian infrastructures and buildings, including schools and hospitals. At least seven hospitals and clinics in the region have been bombed and put out of service by government-led air raids during the past year, Mohammed said. The medical infrastructure in the province will not be able to deal with a huge influx of wounded people in case of a large-scale assault. Will chemical weapons be used during the battle? In addition to the threat of conventional fighting, civilians also face the threat of a chemical weapons attack - a claim made by the United Nations, as well as various sides to the conflict. The US has warned the Syrian government against using chemical weapons in Idlib. "Let us be clear, it remains our firm stance that if President Bashar al-Assad chooses to again use chemical weapons, the United States and its Allies will respond swiftly and appropriately," the White House said in a statement earlier in September. Marine General Joseph Dunford, chairman of the Joint Chiefs of Staff, told reporters on September 7 that the US armed forces and the White House are developing a plan with "military options" in case chemical weapons are used in Syria. Syrian and Russians officials have rejected the US claims and suggested that "staged" chemical weapons attacks are being planned to prompt Western intervention. "Various provocateurs, including extremists and well-known provocateurs calling themselves the White Helmets [volunteer rescue teams operating in rebel-held parts of Syria], who are famous for staging chemical weapons attacks and blaming them on the Syrian government, in order to provide the western countries with an excuse to carry out attacks on Syria," Lavrov told reporters last week. According to Kabalan, these statements indicate that the Syrian government could be planning to use chemical weapons. In the past, he said, the government saw it necessary to use chemical weapons in areas where conventional arms, including aerial campaigns, were not sufficient to make progress in the battlefield. In particular, the existence of underground shelters and tunnels has been a great challenge to Syrian government forces. "The only way they manage to smoke people out of the tunnels is by using chemical weapons. Why did [Assad] use chemical weapons in Ghouta - because that was his only way to win," said Kabalan. Over the past three years, rebels have been building tunnels across Idlib's urban areas. In the lead-up to the potential offensive, amid growing fears of possible chemical attacks, more tunnels have been dug and reinforced. What happens if Idlib falls? At the Tehran summit, Russia, Turkey and Iran vowed to find a "negotiated political process" via the Astana diplomatic track. However, it remains unclear what an upcoming political solution would entail. Russia and Iran have insisted that Assad stays in power. The US, for its part, has suggested that he could not be part of a government acceptable to all Syrians. With the main political opposition bloc rendered ineffective in negotiating on behalf of the Syrian people, those who oppose Assad are left without adequate representation. It is also unclear whether Syrian refugees will be able to go back. While Russia has encouraged returns, SNHR's Abdulghani believes those who decide to do so will not necessarily find safety back home. "These refugees will risk detention, torture and will be subject to forced disappearances by the regime," he said. There is also a possibility that refugees would have no homes to return to. In April, the Syrian government passed the so-called Absentee Property Law, or Law Number 10, which gave citizens 30 days to register property with the ministry of local administration or risk confiscation. The legislation, which has not yet been implemented, could see the 13 million displaced Syrians - either within the country or abroad - stripped of the rights to their property. The displacement of millions and the death of at least half a million Syrians have also deepened the country's sectarian divides. According to Kabalan, while Syria is unlikely to have another uprising, security will not return to the country. Instead, Syria will witness a precarious security situation similar to the one in Iraq following the 2003 US invasion. Without a just political solution, said Kabalan, Syria will not stabilise.